The Magician stands confidently in front of a table with all of the symbols of the tarot suits: pentacles, cups, wands, and swords. Each object symbolizes the metaphysical four elements: earth (pentacles), water (cups), fire (wands), and air (swords). The Magician points upwards with his wand. His right-hand points downwards to the earth: “as above so below”. Above the Magician’s head is a lemniscate symbol representing infinity and balance. This symbol is also mirrored in his belt which is an ouroboros, an alchemical symbol of a snake eating its tail. The Magician is surrounded by roses symbolising passion and lilies representing truth and purity. The Magician is master of their craft and domain. When it shows in up your reading, understand that you have the power and skill to manifest your will. All of the tools needed to move forward are at your fingertips. Often times the catalyst to manifesting your desired outcome is willpower. This is a card of mastery, skill, and competence. The Magician asserts that you have everything you need right now to reach your goals. If you’re feeling lost, take stock of what’s around you. What or who do you have access to that can help you achieve your goal? Be resourceful and examine all of your options. This is a great card to appear in a reading for positive outcomes. It can signal that what are desire will be manifested soon. The Magician is connected to alchemy and magic, it often represents spiritual desires transforming into physical reality. If you’re reading on the results of a project or vision board, this is a great outcome card. The Magician urges you to step into your personal power with confidence. It’s a call to act. You are not lacking in anything. This is especially true if you’re addicted to finding that one more class or that one bit of additional information to finally feel confident enough to act. Stop searching for that next magic bullet that you think will make you more prepared. You’re already ready, now do your magic! In love, the Magician is passionate, charismatic, and capable. They’re dependable and make great friends and partners. If you’re looking for a relationship, use visualization to hone in on what you want in a partner. As the Magician, you have the power to manifest a fulfilling partnership. Because the Magician creates from the resources around them, you are likely to find a romantic partner through friends, family, or work. The Magician in a work-related reading indicates a high level of competence in your field. It indicates that you are well equipped for your career. If you’re feeling doubtful, know that you already have access to the skills and materials needed to do your job. Others recognize your talents, you just need to embrace your confidence. The Magician is able to gather what’s already there and create magic. This makes it a great card for those who manage resources or create products. An example would be someone who facilitates community resources in the nonprofit sector. Or, an artisan or manufacturer who is producing tangible items. It can also represent someone who wields political power behind the scenes. This is a very charismatic and confident individual. Their personal power shouldn’t be underestimated. They are highly driven, and if given a task, often see it through to the end. 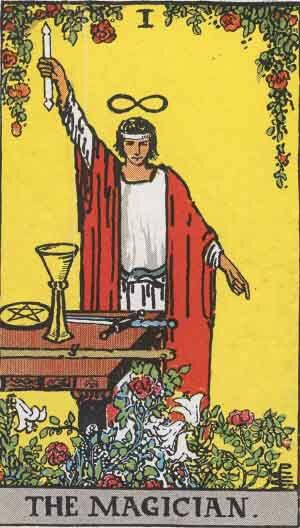 Individuals represented by the Magician card are incredibly resourceful. This makes them excellent team members and in projects or fields with limited resources. If often surprising how they’re able to achieve so much with seemingly so little. It can also allude to individuals who are magically inclined and powerful manifestors. The Magician reversed represents a blockage in your personal power. Most often, it’s a mental block getting in your way. Are you giving your power away to someone or something else in this situation? If that’s the case, you must embrace your personal power in the situation. Do not let someone else’s negativity distract you from your goals. Be careful that you’re not letting excuses get in the way of taking action. This is very true if a perceived lack of resources is holding you back. Really dig deep and understand that you hold a lot of power to change things. Ask trusted allies for input on resources that will help you move forward. The key to resolving the issue might be hiding in plain sight. Sometimes the Magician card in reverse may not represent internal self-sabotage. Instead, there might be outside saboteurs working against you. As sad as that is, sometimes others don’t have our best interest at heart. Keep your eyes open to signs that you’re being thwarted by another person. The Magician card has historical associations with trickery, gaming, and conmen. Don’t allow yourself to be taken for a ride. The Magician is a very powerful card, but if taken to an extreme, can indicate selfishness. The Magician as their highest self is channeling energy from the heavens to the earth for the greater good. You can be easily corrupted if you hoard that power for yourself. Make sure you are playing fair. Resist the urge to see other’s power as a threat to your own. The Magician reversed in a love reading signals stagnation. There can be difficulties getting a new relationship to manifest or a stalled one to progress. In the case of manifesting a new love, resist the urge to be passive. The potential for a fulfilling relationship is there, but it’s blocked. Be very cognizant if any self-limiting beliefs are at play. The Magician reversed is often associated with deception. Because of this be on your guard about motives until you get to know the person better. If the Magician represents a potential partner or friend, don’t rush things. Give yourself time to rule out any hidden agendas. The reversed Magician can spell sabotage and blockages at work. A lack of resources is hindering you. Sometimes this can be remedied by asking for help or more assistance. Unfortunately sometimes the resources and staff members are just not coming through. You may have to sacrifice some of your own resources (whether that be time, money, or power) to see a project through. If you’ve already reached your limit of personal resources to contribute, then you maybe need to cut your losses. If these blockages are inexplicable, then be wary of sabotage from above or below your position. You may need help dealing with difficult personalities to overcome this issue. Find out where the problems are coming from and what the root of the issue is so that you can move forward. Being reversed blocks, and sometimes, subverts the Magician’s power. If the Magician reversed represents you in a reading, you may feel powerless and floundering. If this is the case, it’s very important that you examine whether you’re suffering from self-limiting beliefs. Old stories about your abilities could be holding you back from your potential. A darker element of the Magician reversed personality is deception. Be wary of your own motives in holding yourself back. You may exaggerate situations to sway opinions in others. Keep your motivations clean. Recognize and honor the freewill of others. In the Delta Enduring Tarot, a woman prepares a stew. She utilizes whatever she has on hand to create it. Of course, she’s most likely making gumbo. And if you’ve ever attempted to make a rich, dark roux then you’ll appreciate the magic touch needed to achieve it! The cast iron pot evokes a witch’s cauldron. It can be also be interpreted as a take on the Stone Soup fable. In the story, a clever traveler convinces reluctant villagers to share ingredients to build a communal soup. This speaks to the Magician’s ability to gather resources for the betterment of both themselves and their community. The surreal Wooden Tarot Magician is one of the most striking in the deck. There’s a hint of a second pair of eyes concealed under the wings. The traditional infinity symbol associated with the Magician card can be seen below the moth. The nocturnal nature of moths hints at work done at night, in secret, or from within. The Mesquite Tarot’s Magician contains many traditional elements of the card. There’s a lemniscate symbol above the figure’s head along with the elemental suits floating beside them. What I love about this depiction of the Magician is the powerful pose the figure takes on as it channels energy from the universe to the earth. The Mystic Mondays Tarot is a colorful, minimalist deck. This Magician is cloaked in dark robes and holds two glowing forms in between her hands. This card alludes to the quieter inner strength and power of the Magician.